Semiconductor Engineering - Psst, Says 5G... Wanna See What My New Antenna Tech Challenge Looks Like? Semiconductor Engineering - Psst, Says 5G... Wanna See What My New Antenna Tech Challenge Looks Like? Power consumption remains a major barrier to 5G rollout. 5G offers incredible potential, enabling 1000X more traffic, 10X faster speeds and an increase in the device battery capacity by 10X! So why hasn’t 5G technology been rolled out yet? The benefits all sound great, but there are also some challenges that need to be addressed. 5G is destined to cause a revolution around the world with burgeoning industries like autonomous driving, internet of things (IoT) and virtual reality (VR), but this revolution will take time. There are multiple reasons for the wait, but let’s discuss one of the most critical reasons: Power consumption! We know the frequency range for 4G is ~3kHz – 6GHz. Whereas, the frequency range for 5G is much higher at ~3kHz – 300GHz. These high 5G frequencies become part of the millimeter (mm) wave range, where antenna design is one of the most critical aspects. It is certain that there will be changes from 4G to 5G antenna technology, which can cause significant design challenges. Making these antennas less power hungry and higher performing will be interesting and crucial from both economic and environmental standpoints. Figure 1: Key difference between 4G and 5G antenna technology. 4G: At the 4G frequency range, a high-powered antenna station is capable of delivering signals efficiently to the devices around it. 5G: 5G mm waves don’t travel well through obstacles. The proposed solution is to have many small-cell antennas strategically placed around a large antenna, which allows the signals to be transmitted efficiently around obstacles. This method is a promising solution to meet current traffic demands, but this approach has elicited some concerns regarding energy efficiency. Until 4G came out, the traditional antenna technology’s transmission power (energy consumed by power amplifier, RF chains) was greater when compared with the computation power for wireless signal processing. However, with 5G the computation power would increase manifold as small-cell basestations (BSs) are replacing macrocell BSs to perform the function of wireless data transmission in 5G cellular networks. Moreover, the computation power of a 5G small-cell BS can approach 800 watts when a massive Multiple Inpute Multiple Output (e.g., 128 antennas) is deployed, which is huge! 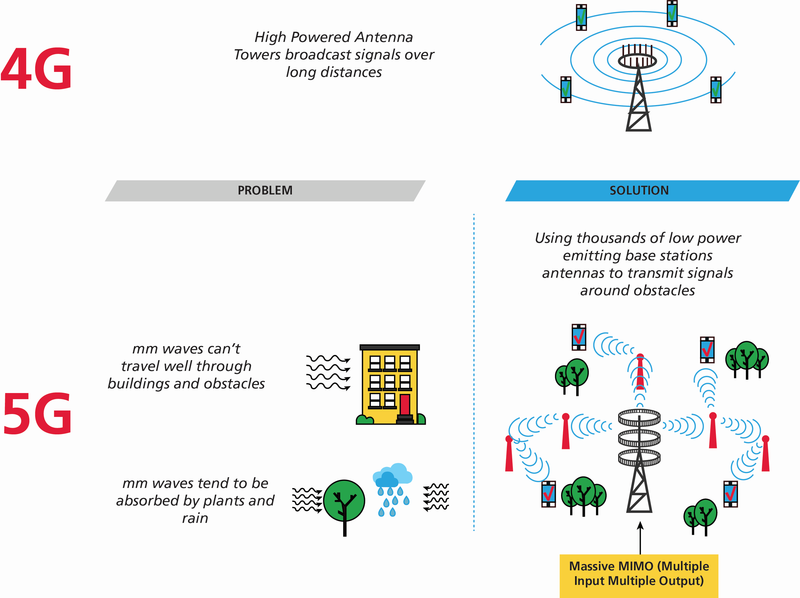 As noted from the proposed 5G solution in Figure 1, even if the small-cell antennas provide low power consumption and high performance, a large-scale deployment of these antennas will increase the energy consumption. There is ongoing research dedicated to exploring different ways to make 5G small-cell antenna technology less power intensive. For instance, an antenna BS sleeping scheme has been considered as a way to improve energy efficiency where the RF chains and transmitters of the BS are closed to save transmission power. Another method being evaluated is where the computation power of the small-cell BS is improved by the volume and complexity of signal processing. One thing is for sure, 5G antenna technology energy consumption of will be of prime importance, and researchers need to figure out ways in which it can be minimized while maintaining the highest levels of performance possible. Even with the known challenges, it can be said that, based on its unprecedented benefits, the future of wireless communication looks bright with 5G.